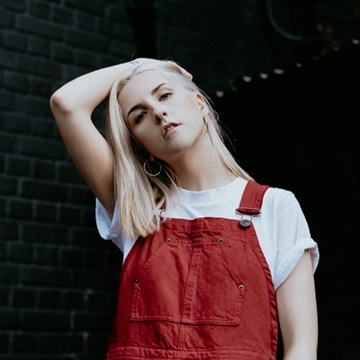 Laoise is an electro-pop artist hailing from Galway, with her music incorporating elements of synth, soul and alternative pop. She grew up surrounded by traditional Irish music, and having learnt to play the fiddle at the age of 5, she would regularly attend traditional Irish sessions with her parents. It was this sense of togetherness through music that made her want to pursue being a musician as a career. Taking her cues from the silky production of acts like Astrid S, MO and Skott but also deeply inspired by household names such as Kate Bush and David Bowie, Laoise has now crafted her skill to become a successful artist in her own right. RTÉ 2FM Radio have selected her a ‘Rising Artist of 2018’, her track ‘Rich’ was featured on RTE One’s ‘Striking Out’ and she’s been praised by a multitude of tastemakers in the UK. Debut single ‘YOU’, a song originally a college assignment, has had over 299,000 streams since it’s release and peaked at #4 in the Spotify UK Viral 50. Debut EP ‘Halfway’ that was produced using one ramshackle microphone and an old laptop has received an abundance of noteworthy praise from established blogs such as Notion Magazine, The Line of Best Fit, Buzzfeed, Nialler9, The Last Mixed Tape and more. Along the way, Laoise has appeared at festivals such as Forbidden Fruit, Body & Soul, Longitude, Other Voices, LIMF and Electric Picnic. Laoise's new single ‘Again’ is set for release September 21st.